McLaren dominated in the Prancing Horse house. Coming into Monza, it seemed pretty one-sided who was going to win the race. Yet, as the race finished, the winner needs to be seen to be believed; Gerhard Berger took the win, following mistakes made by Jeremy-Etienne Voeckler in the last few couple of laps. Ferrari had a terrible race; first, Senna crashed and had to pit for a new front wing. Later, Prost retired with a transmission problem. Then to add insult to injury, Senna crashed again, this time with permanent damage to his car. It was all left to McLaren to take the 1-2. But, in the last couple of laps, Jeremy-Etienne Voeckler did a lazy spin, and he only recovered in 5th. 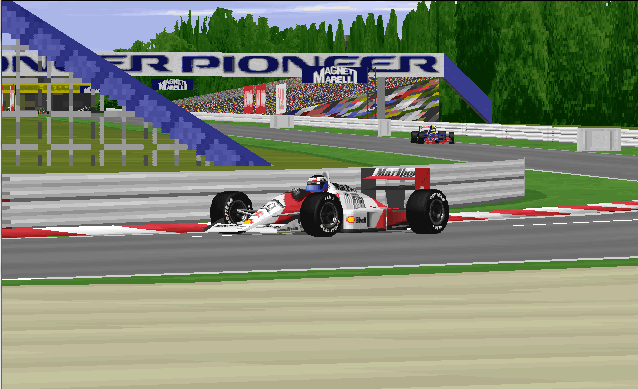 This left Gerhard Berger to take the win at Monza, followed by a calm and fast drive by Brendon Cassidy, with a surprising Martin Brundle completing the podium, helped by the power of Ford’s work unit, the GBA. Nicchi was left to take a fantastic 4th place, and Gauthier pushed a underpowered car into a fantastic 6th, with the Osella of Nicola Larini also making a surprise 7th place. Infinite Improbability Drive of the Race – Guillaume Gauthier, pushing a underpowered car into the points. Reject of the Race – Ferrari, totally embarassing display in home country.